Zelda at the Oasis – Official Site | Zelda at the Oasis, a new play by P.H. Lin, directed by Andy Sandberg, now playing Off-Broadway at St. Luke’s Theatre. Zelda at the Oasis played its final performance Off-Broadway on February 15th. 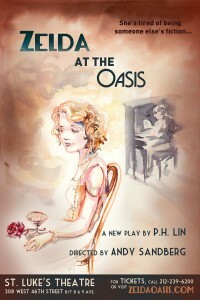 Zelda at the Oasis, a new play by P. H. Lin, directed by Andy Sandberg, is now playing Off-Broadway at St. Luke’s Theatre, 308 West 46th Street, in the heart of Times Square. Zelda at the Oasis features Edwin Cahill and Gardner Reed. Performances began on November 16th, 2012, and the production celebrated its official opening night on December 4th, 2012. Visit the “Reviews & Press” page to see what the critics had to say!